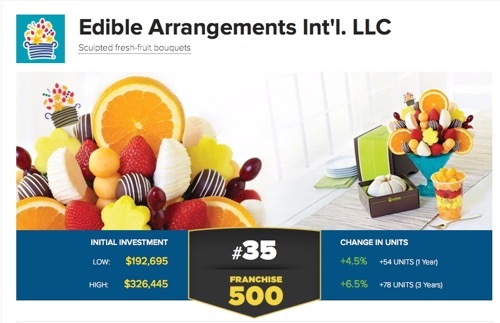 Over a decade and a half later, it seems that things just keep getting sweeter at Edible Arrangements as we were recently recognized by both Entrepreneur magazine and Forbes as a top global franchise, a big win for both our corporate staff and franchisees! The good news began when Entrepreneur named Edible Arrangements to their Top Global Franchise List for 2016. A number of factors were considered in this ranking, including international locations, size, growth and stability of the brand. Starting as a one location, small shop in East Haven, I am amazed and thankful every single day that we have seen the international growth that we’ve achieved today. I am thrilled to see that all the hard work our corporate staff and franchisees put in every day has been appreciated and acknowledged by such a well-respected magazine like Entrepreneur! Topping it off, we earned a top spot from Forbes when Edible Arrangements was ranked as a top 10 best franchise investment. This recognition from Forbes confirms the great work the Edible Arrangements team does to ensure that our 700+ franchisees receive the best service and support in order to have the greatest opportunity to succeed in their pursuit of the American Dream. All I can say is, Wow! It truly is an amazing feeling to see all the hard work of the entire Edible Arrangements family recognized twice in one week by two leading national publications. We are all looking forward to many sweet years ahead!